Are Sugar Gliders Better Pets Than Flying Squirrels? Sugar gliders and flying squirrels are similar in size. Both love to climb and can glide. But these two pocket pets have different needs. Deciding which animal is best for you depends on what you want in a pet and what you're able to provide your fur friend. Sugar gliders and flying squirrels require large, aviarylike habitats. Their native homes are tree hollows, so they need vertical space to climb and nesting boxes where they sleep. Both flyers and gliders enjoy playing with bird toys and running on exercise wheels. Both animal types are nocturnal, so you're best off not housing them in your bedroom. Sugar gliders vocalize frequently, so they can be noisy at night. Flying squirrels vocalize only occasionally, and when they do it isn't much more than a squeak. You can bond flyers or gliders to you by keeping them in a sleeping pouch on your body for several hours a day. Both animals can be highly affectionate pets. Gliders may become overly attached to one person if they're not properly socialized with others, becoming violent toward other people. You should plan on keeping more than one sugar glider since they're social animals who will get depressed if kept alone. Flying squirrels are social creatures that bond well with people and other flyers. Flyers enjoy interacting with their owners and can be kept as single pets. Neither pet can live on a diet of pellets or kibble alone. You can buy prepackaged foods designed for sugar gliders or squirrels, but these animals still need fresh fruit, mealworms, grubs, insects, eggs, nuts and seeds in their diet. Calcium is important in flyer and glider diets; supplementation may be necessary. In the wild they get calcium by eating prey and eggs shell and all; you can supplement a flyer or glider's calcium intake with tablets, bonemeal powder (pet- or human-grade only), powdered eggshell or bone chew toys such as cuttlebones sold for birds. Sugar gliders are smell-oriented; they often mark with their urine. Males have scent glands in three different places on their bodies that they use to mark their homes and their nest mates. 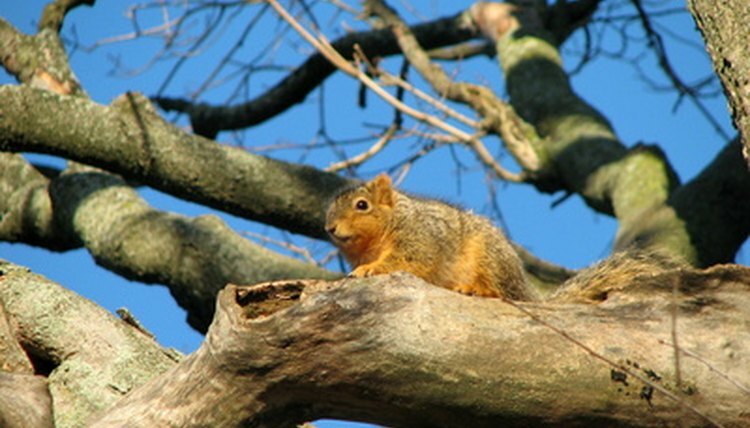 Flying squirrels don't mark their territory with urine or have a distinct smell. Sugar gliders and flying squirrels can't be potty trained, so they relieve themselves throughout their habitat, throughout your habitat and on you. Both glider and flyer habitats need frequent cleaning. Sugar gliders can live about 15 years, and flyers live 10 to 15 years in captivity. Like any pets, both animals can get diseases; because they're considered exotic pets, not every veterinarian knows how to treat them properly. The most common cause for illness in gliders and flyers is calcium deficiency. Calcium deficiency can cause arthritis, broken bones and back limb paralysis. Both animals can also contract parasites, bacterial diseases and viral diseases. You may need a permit to own a sugar glider or a flying squirrel, and in some municipalities it's illegal to own flying squirrels. Make sure you do your research and find out from the proper authorities whether it's legal for you to keep a flying squirrel in your home.